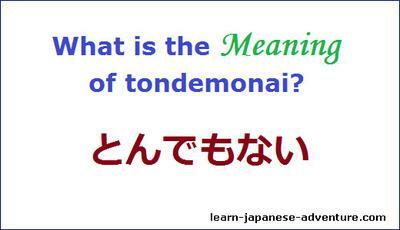 What is the meaning of tondemonai? What is the meaning of とんでもない? It seems like tondemonai has several meanings as I always heard Japanese said that in different situations in the drama. I am quite confused when to use it. Meaning: The discussion has gradually gone into an unexpected direction. It's used when you think someone must be joking on what he said. It's used when you strongly denied what someone said to you. 5. All the above meanings are used negatively. However, on the other hand another meaning of it is commonly used in keigo (honorific form) like: "Not at all", "It's ok", "No worries"
A: Thank you very much for all your helps. B: Not trouble at all! There is one more point to take note that tondemonai is an i-adjective, not a verb. I think even some native Japanese used it wrongly thinking that it is a verb and say とんでもありません (tondemo arimasen) or とんでもございません (tondemo gozaimasen) in order to make it sounds more polite. They probably think that the ending part of it is ない (nai), just like nai-form of a verb. Therefore they think that it should be ok to change it to "arimasen" or "gozaimasen" in honorific form. とんでもない (tondemonai) is one word by itself, just like つまらない (tsumaranai - boring) and あぶない (abunai - dangerous). You cannot say つまらありません (tsumara arimasen) or あぶございません (abu gozaimasen). There are no such Japanese words. If you want to be more polite, you can say とんでもないことです (tondemonai koto desu) or とんでもないことでございます (tondemonai koto de gozaimasu). Comments for What is the meaning of tondemonai? It's an interesting Japanese phrase. Maybe that's only an Osaka thing. Still, Japanese people go crazy when a foreigner says it just because it's so unexpected. It's a Japanese joke by the way. Sources: I live in Osaka. I am not familiar with 関西弁 (kansai ben). Anyway, thanks for the additional meaning of tondemonai in osaka. Although this meaning is less common, tondemonai can also mean 'ungodly', 'unholy', or even 'damned' when used as an adjective. Hi aqua, thanks for adding that. The most common use I ran into in Japan roughly meant: "Quite to the contrary." As in, "Tondemonai, kochira koso." Quite to the contrary, I should be the one (apologizing).